KAA Festival, originally only a small cultural event for the students of the Department of British and American Studies, is now growing in size and changing its nature completely. After previous very successful years, we are back in a new attire: a bigger show at a bigger venue and for the whole public because this year’s motto is “We want More”. What happens when a junior government minister finds a living corpse in the hotel suite where he is having a secret affair with the secretary of the Leader of the Opposition? The theatre troupe ActofKAA has rehearsed this amazing play titled “Out of Order” by Ray Cooney, which was given an award for Best New Comedy in Britain. Come to have fun and stay with us also for the after-party – the entertainment will be taken care of by the music band The Raw Bishops. The programme starts at 7 p.m., so please come in time. Where and when can you buy the tickets? – This information will be updated on the KAA Festival Facebook page. Some complimentary refreshments will also be provided. 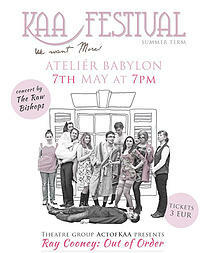 We are looking forward to seeing you all in Ateliér Babylon. Would you like to gain some exposure too? Are you itching to get on the mic? Would you like to show off your musical playing skills? Would you like to gain more confidence singing in public? Would you like to exhibit your artwork at the venue? Let us know!